G Loomis fly reels, can be a perfect compliment to one of their top of the line fly rods. Take a look at the short descriptions below. If you're interested, click on the links to read more or buy. Venture: This is a nice looking reel at a decent price. Featuring a wide-range adjustable composite disc drag, roller clutch bearing, quick release spool, counterbalanced handle, and a rich, champagne gold anodized finish, the Venture reels are available in three sizes: #3, #5 and #7. Priced $100.00. Spare spools will run about $60. 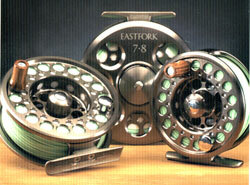 Eastfork: This is a beautiful fly reel that has been both machined and forged to give you the best of both worlds. Has a rich wooden handle and comes in 3-4, 5-6 and 7-8 models. 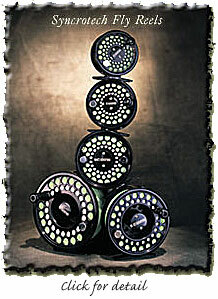 Extra spools for these reels are $85-$95. The reel itself will cost you about $165-$185. Synchrotech: This is the G Loomis top of the line reel. It is machined from a solid piece of aircraft grade aluminum. 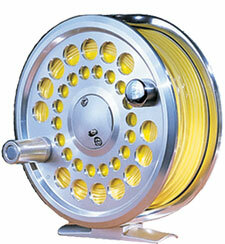 It is a super light reel that fishes great in saltwater. The three largest models have a special anti-corosion coating on the key internal parts. The price tag is $300-$525. An extra spool costs $165-$260.